Here are the volunteer workdays and events for February 2016! Tools Maintenance, Tuesday 2nd at Tŷ Hyll: Come along and help maintain the tools we have been using throughout 2015. We will have an expert on hand to guide us on how to maintain all sorts of tools, as well as prolonging their usefulness. Set at the beautiful Ty Hyll, what’s not to like? Volunteers are welcome to bring their own tools to sharpen. 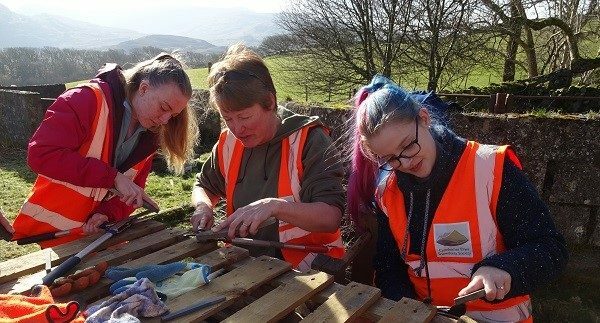 Hedgerow and Tree Planting, Wednesday 10th at Nantmor: Within the local Meirionnydd Oak Woodland at Nantmor you will find a several Lesser Horseshoe Bat roosts. The Lesser Horseshoe Bat is rare in the British Isles and is confined to Wales, western England and western Ireland. We will be planting hedges in order to connect these wooded areas. We will be creating a much more suitable habitat for the Bat population as well as other local wildlife. Come and help us create a habitat. Tidy Tŷ Hyll Litter Pick, Monday 15th at Tŷ Hyll: Interested in helping us ‘Keep Wales Tidy’? The Snowdonia Society are working together with the Keep Wales Tidy team and are planning a Litter Pick along the footpaths that surround Tŷ Hyll. 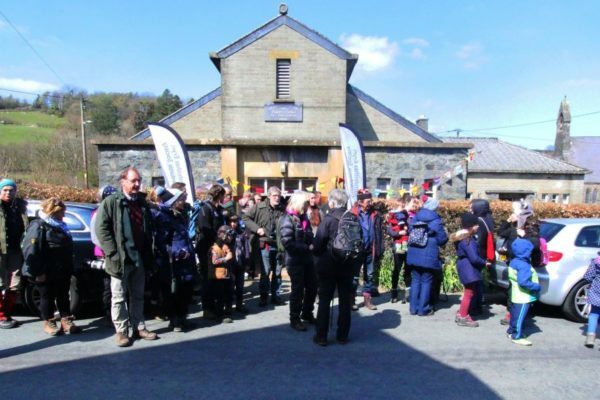 A member of the Keep Wales Tidy team will be joining us to explain more about their project, and it will be a perfect opportunity to hear more about the Snowdonia Society and Tŷ Hyll too! New volunteers are always welcome, please get in contact with Bethan! All equipment will be provided, just bring yourself and some suitable clothing and footwear! Rhododendron Bashing, Tuesday 16th at Bryn Gwynant: The Snowdonia Society have been working alongside the Snowdonia National Park Authority in Nant Gwynant for some time removing Rhododendron Ponticum from the area. Rhododendron is one of the top 3 invasive species to the Snowdonia National Park and it is easy to see the damage that it has done to our native countryside. One of our larger sites has been the Bryn Gwynant Youth Hostel. You can already see the difference that we have made to the grounds, but the battle isn’t over yet. There are still plenty of Rhododendron Ponticum plants to be removed. Bow saws and loppers at the ready! National Nest Box Week and Half Term Activities, Friday and Saturday 19th and 20th at Tŷ Hyll: Join us at Tŷ Hyll to help us celebrate National Nest Box Week! Organised by the British Trust for Ornithology, National Nest box Week has been established since 1997 and is the perfect opportunity for you to find out more about how to encourage birds to roost in your garden! As well as giving you some tips on the different types of nest boxes, there will be plenty of activities throughout the day including bird watching, wildlife spotting, making birdfeeders and you can have a go at some wild art! All activities are suitable for children and adults – a perfect way to spend your half term! Woodland Workday, Tuesday 23rd at Tŷ Hyll: The upkeep and maintenance of our spectacular woodland depends on the generosity of our fantastic team of dedicated volunteers. Whether you’d like to help out with our bird survey or you fancy something a bit more physically challenging like footpath maintenance, join us to tackle this month’s woodland tasks! Wildlife Gardening every Monday at Tŷ Hyll: An opportunity to help maintain the beautiful garden and woodland at Tŷ Hyll. New volunteers are always welcome – get in contact to find out how you can get involved! Accredited training in footpath maintenance on Snowdon!